It's funny how really small things can bug you. In this instance, since upgrading to the Treo 650 I had found myself really annoyed with the limited color themes available in 'preferences' particularly as the 'Carnival' theme that I had grown fond of on my Treo 600 was no longer available [Ooops... As Perry points out, I missed seeing that Carnival was available after all...]. 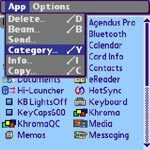 Faced with this, I thought about how silly it was that one could not fully customize the colors on our Treo instead of just having the option to choose from predefined themes - surely it wouldn't be too difficult for palmOne/PalmSource to add this functionality. 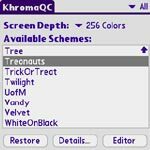 By coincidence, yesterday I stumbled upon an application called Khroma which allows me to do exactly what I wanted and fully customize every single color detail on my Treo in a simple and elegant package while at the same time offering 66 more ready-made themes from which to choose. 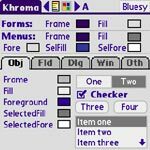 As is so often the case for cool add-on applications for our Treo lately, Khroma has not been developed by megacorp but instead by a single dedicated developer who after putting in all the effort decided to... make Khroma freeware. I don't believe that the best things in life are free but this will be a welcome exception to the rule. Below are screenshots of my attempt to create a 'Treonauts' theme within Khroma and how it looks in the main application screen with the menu and categories pull-downs open. 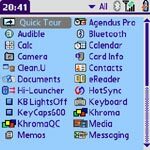 If you like our theme and would like to install it on your Treo you can dowload this .txt file, copy and paste it in a Treo memo [or even more easily: email it to your Treo as an attachment, then select 'Open with Memo'] and finally import it within Khroma. If you would like to create your own theme I would suggest that you a) find a theme that you like; b) select 'New' in the menu and c) start changing the colors to fit your needs (you'll get the hang of it after some experimentation). 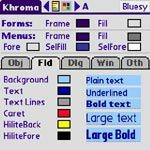 I can't even begin to describe how happy I am to have found Khroma. I can now make the most of my high-res color screen and have the freedom to personalize my Treo whichever way I want - I almost feel as if I had just been given an entirely new smartphone. Certainly this is one more application that palmOne should bundle on the next Treo. Just an FYI -- the Carnival color theme is availble on my Treo 650 from Sprint. It was my favorite on my Tungsten T3 and it was right there when I went looking on my Treo 650. Is this availability provider dependent? Man that Khroma is Sooooo cool! I love it. I was just thinking the other day how I wish that there were more color options. Still, I guess that not finding it at first helped me to come across Khroma with which I have now created my very own (much nicer) personal theme. Thanks, Andrew. And THANK-YOU for the Web site. I cannot think of another product that has such a passionate user base. Treonauts gives this user base a voice and a place to communicate. And, hopefully, this "voice" will continue to prod Palm in the right direction. Is anyone else having issues with using Khroma after updating to the latest Sprint 1.08 ROM update? I tried reinstalling it after the update and I still have issues. The issue is that when i attempt to save the theme, it soft resets. Thanks for liking our theme ;-) and for letting me know that it wasn't importing properly. I've now updated the file to a .txt which should be much more easily imported and have no error. Also, testing it again I think that the easiest option is to email it to your Treo as an attachment and then select 'Open with Memo'. After this importing into Khroma should be a breeze. Sorry no reports on this front... hope that you'll be able to fix it soon. I was just thinking the other day how I wish that there were more color options. i can not get this thing to work.. i need some help or some more detailed steps. I just downloaded Khroma for my palm centro and love it. The only problem is when I go to activate the theme and then press the home button to go back to my main menu, the theme is not showing. Instead of the theme that I made and supposedly activated, it is just the original theme. In other words, how do you correctly activate a theme?